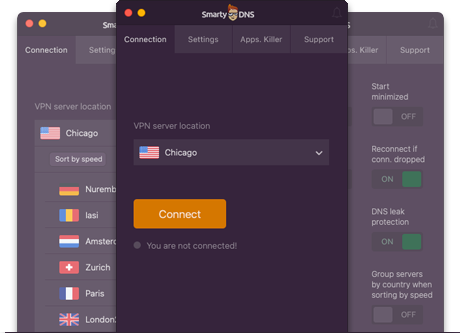 SmartyDNS VPN App. Easy to use. Advanced customizations. Leave all the complicated, geekish details to us. We went the extra mile to make our software really easy to use. You just have to install it and you are good to go. You can start using it instantly. If you need a fast app this is what you need. Turn on and off VPN or Smart DNS by simply clicking one button. And that is all the information you need to successfully use our software. We want to answer every need of privacy and safety you might have. In order to do that we made sure you can easily adjust the settings of our software so it will give you full benefits of its features. For us fast data transfer is very important, so we take it very seriously. In order to make the best out of your connection we added the “Sort by speed” feature so you can easily choose the fastest server at any given moment. It’s like you’re driving a sports car were you can shift gears any time you want in order to achieve the best speed on the track. What you do on the Internet it’s your business and nobody else’s. But that also means that you have different needs regarding speed and security, depending on your online behavior. Don’t worry, we got you covered. Based on daily online routine you can easily choose your preferred VPN protocol for optimized speed and safeness. Even if your internet connection fails you, we will not let you down. With our special Apps Killer feature you will be protected even if the connection is not stable. Set up which applications should be closed when the connection drops. That way you will have complete control on any online software you run. At any time you can check for yourself that your data transfer is properly encrypted. Our DNS Leak protection feature will allow you to use our DNS addresses to make sure that your DNS requests are going through us instead of directly to your ISP. Safe is the name of the game and we are playing it in the big league. You can access any information you want, regardless of regional directed content. This goes for the sites that customize different content for specific countries or regions. While using Smart DNS, you can choose the region used for multi-regional websites. We trust that fine-tuning features of our software will make you fully confident about the high standards of our service. You can choose how often your IP address will be automatically updated. That’s useful when you ISP often changes your IP address.